During the first six months, babies learn to sit on their own, and start exploring all the new things around them with their hands – and often mouth! To make the most of the natural inquisitiveness of newborns, there are plenty of bright, colourful toys which are designed to encourage babies to grab, push, pull, and begin interacting with their world. Baby Toy Safety: What Should I Look For? During this time babies also seem to want to put absolutely everything in their mouth. This is totally normal but make doubly sure that the toys are safe. Check toy safety marks for the ‘suitable for children up to 36 months’ symbol – and if it isn’t there, it’s not right for baby so don’t buy it no matter how cute it is. Small parts can come off and become a choking hazard, so always buy baby soft toys and not those designed for older children. Play centres, baby gyms and little swings are fun activities which will keep active minds and hands busy. Many small babies love the rocking and bouncing motions that they get playing in these types of toys and the exercise will help them to strengthen their bodies and keep them active. Different shaped baby toys will intrigue a newborn, and anything that stimulates lots of different senses will keep them happy and interested for a while. Toys to introduce to baby include soft balls, stacking rings, pots and teething rings. Any baby toys that have flashing lights, farmyard or other noises and music will also be endlessly fascinating to young infants. Newborn babies’ vision isn't very sharp yet, but their hearing is usually pretty good, so musical cot mobiles are a really cute way to stimulate baby's early developing senses. For this reason, a cot mobile is designed to appear in a baby's field of vision to help them to relax. Some parents also find that mobiles can be a useful distraction when they are changing nappies. You don’t have to hang a mobile above your baby’s cot, as some of the newer models are designed to attach to the side of the cot and provide your baby with music and light shows. Between three and six months a baby will start to develop spatial awareness, and most cot mobiles have a selection of attractive dangling objects which should encourage him to look a bit closer at the mobile, just to find out what they are, where they are going, and if he can reach them! In the first few months of life, your baby will be developing his five senses. 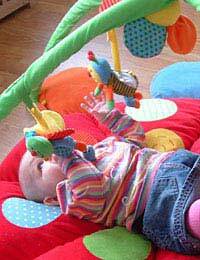 Play mats and play gyms help babies find out more about their world in a safe environment. Play gyms can be used until baby is about six months old so worth investing in the best type of play mat you can afford. Some have activities – buttons to press, different fabrics to explore, pictures, sounds and music. It’s all about gradually introducing your new baby to the big wide world – safely – when it comes to baby toys and cot toys. Have fun choosing cute and fun baby soft toys and mobiles, and you’ll be able to make the most of the wonder a new baby has in his surroundings.